A fleet operator uses jet fuel (Jet-A, JP-5, JP-8) mixed with 5% salt water at 250˚F (121˚C) to boost the speed and distance of its planes. Since the fuel and water separate when stored, they need to be remixed under high pressure for refueling. A Hydra-Cell model D10/G10 with a Hydra-Cell C62 pressure regulating valve was selected to thermo-cycle the jet fuel through a heat exchanger. Due to the volatility of the liquid, the pumping system cannot use any electrical components. The D10/G10 is therefore equipped with an explosionproof motor (Class I, Div. II, Class 2, Group D/F & G). Other requirements met by Hydra-Cell include a self-priming pump and being able to run dry without damage. 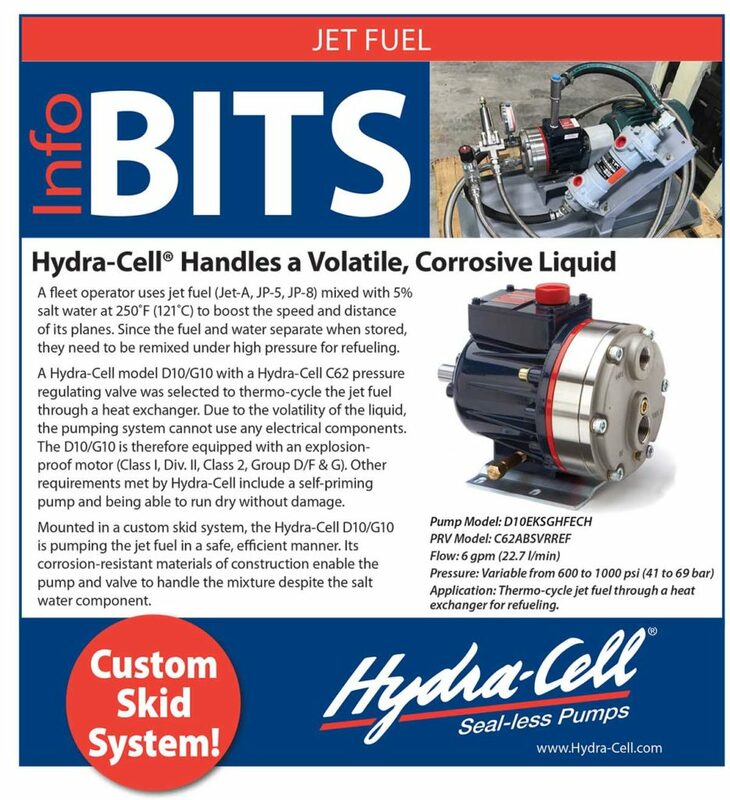 Mounted in a custom skid system, the Hydra-Cell D10/G10 is pumping the jet fuel in a safe, efficient manner. Its corrosion-resistant materials of construction enable the pump and valve to handle the mixture despite the salt water component.